I got a burst of energy the other night (doesn’t happen very often) and finished up this sweet quilt. 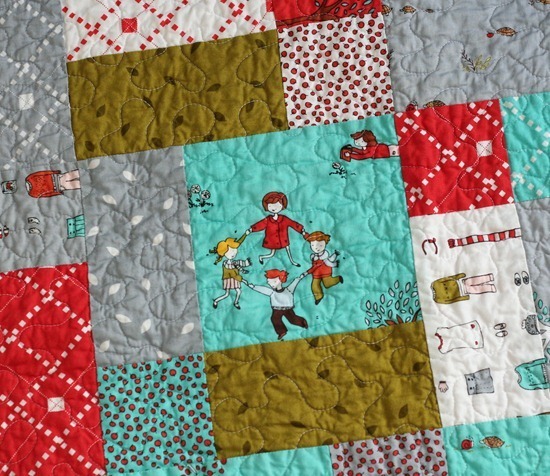 My favorite part of this quilt is this little family playing ring-around-the-rosies. 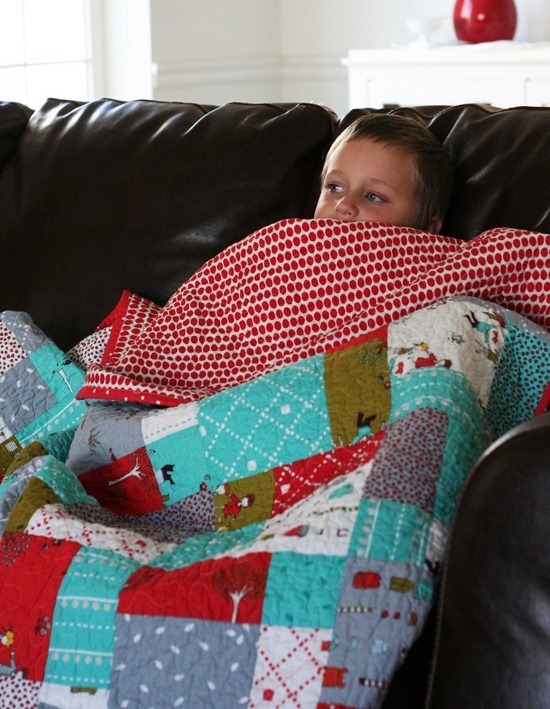 This one is going to live with cousins….but we snuck in a little quilt time before we packaged it up. Someone has to make sure it works… right? Luckily it works just fine and the texture of this one is really great. I haven’t washed a new quilt for awhile and I forgot all about the anticipation of pulling a fresh quilt out of the dryer and seeing that crinkly goodness! The crinkle "reveal" is my favorite part!! Beautiful quilt! Crinkly goodness is the best! My favorite part of a quilt…. And this is a lovely quilt -the fabric is great, especially that backing!! Love the fabric on the back! (Is it weird that I love quilt backs so much?) I also love the fresh quilt out of the dryer moment. Snuggly goodness! I adore this quilt. the colors. the fabric. the warm crinkly snuggle on the couch. very nice! i do love the dotty backing! Lovely and snuggly! I got two charm packs of that line and can't wait to do something with it. Oh…someone is gonna love snuggling with that!!! I have a quilt made from that fabric, too. My oldest daugther made it for me as a gift before leaving for college. I can't even being to explain just how cherished it is. Congrats on a fab finish! I love how the pattern of this quilt really shows off the fabric! Way cute! I also really think the "ring-around-the-rosy" fabric is adorable. It must be hard to give away such a cute quilt! Lovely quilt with lovely colors! OOh, I have quilt envy! Beautiful quilt. Love the colours! All those delicious colours together…love it! Beautiful! I love those colors together too! So cute…and I agree about pulling the quilt from the dryer…it makes it so much more cuddly! And if it's for a child, the quilt will have to become friendly with a washer and dryer! Love it! I haven't had that fun of pulling a fresh quilted one from the dryer in awhile either. Remodel of downstairs just recently completed, I'm ready to get in my new sewing room & get some of those tops quilted. I'm sure the cousins are going to love the quilt. Very nice! Love this fabric. Love your quilts and use of great fabrics. 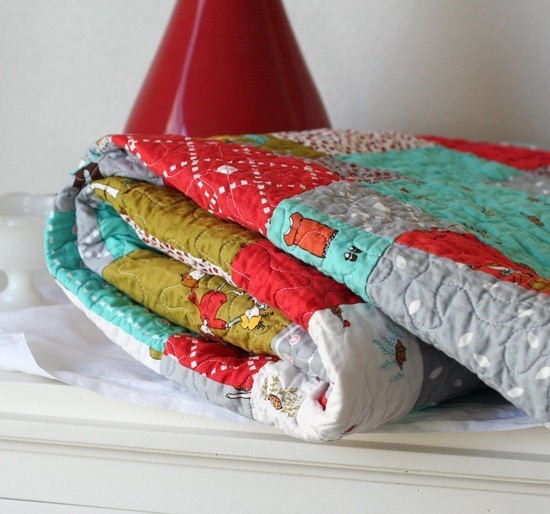 Huge fan of Aneela's fabric designs … Great quilt to showcase all that yummy fabric goodness!!! A lovely quilt and such a nice present for the cousins. Is this the disappearing nine patch? I made this with halloween fabric but this fabric would certainly look alot better. It's super wonderful and the cousins will love it! I love the backing fabric! Awwww! I LOVE testing quilts before I wrap them up to give away! I rarely quilt for myself so the couple of days under that "fresh from the dryer" quilt is all I have with them. Congrats on yet mother beautiful quilt! This sweet fabric will have a special place in my heart always. My oldest daughter made me a beautiful quilt from it and gave it to me a few weeks before she left for college as a thank you. It is beyond precious to me, as is she! such a great pattern for the busy print! I think I'm going to cry! When I read this post a few days ago, I didn't imagine my kids would be the very lucky cousins. Thank you times one million!! What a happy surprise. that is too funny– suprised it made it out the door!